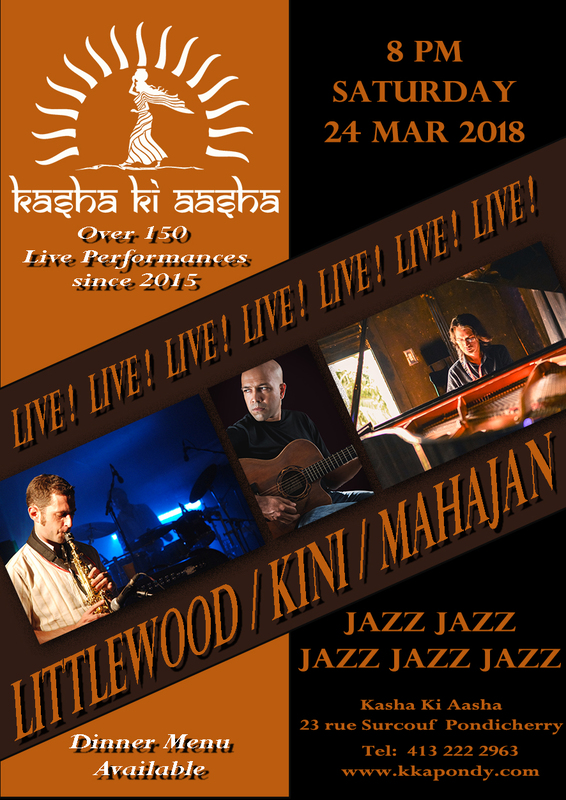 Jazz trio Littlewood / Kini / Mahajan will appear this Saturday evening at 8 pm on Kasha Ki Aasha’s beautiful terrace. Join us for evening of incredible music with these three internationally acclaimed musicians. We suggest making a reservation this Saturday (call 413 222 2963). Matt Littlewood is originally from UK and is currently living in Auroville, India. Jazz saxophonist, pianist, composer and music teacher he studied music at Exeter University UK. 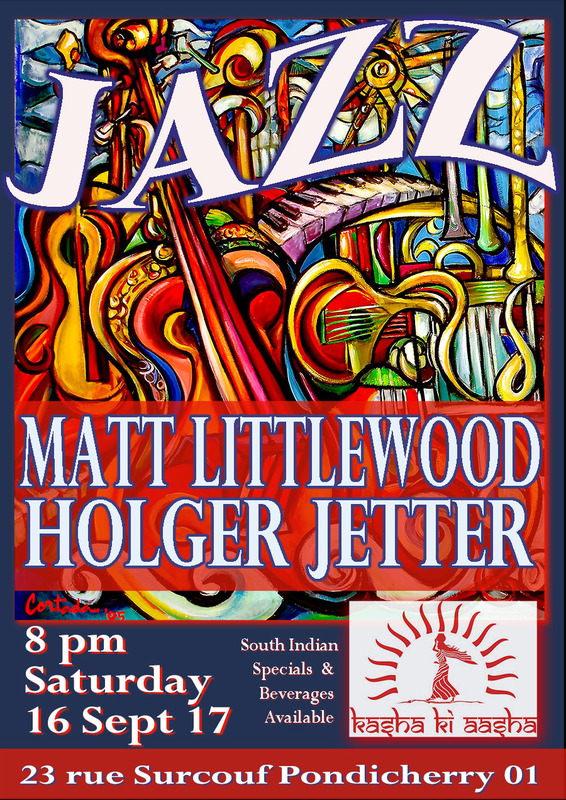 Matt is a very active member of the Indian Jazz and World music scene. Sankarshan Kini is an independent music producer and multi-instrumentalist based in Auroville, India. He explores genres of jazz, blues, rock, folk, and funk with different independent projects. He plays guitar, violin, mandolin, trumpet, and harmonica. He scores for cinema and theater. Aman Mahajan is an Indian pianist, composer and improviser. Having associated with musicians of a plethora of nationalities and musical backgrounds, his work is influenced by traditional and contemporary forms from around the world, and deeply inspired by a sense of unity and connection. Mahajan is interested in musical improvisation as a tool with which to interact, explore and create. Mahajan is presently based out of Bangalore, where he works on musical projects and teaches. He is currently active with piano-guitar duo, Tinctures. He is also a returning faculty member at the Global Music Institute, Greater Noida. Kasha Ki Aasha is located at 23 rue Surcouf, Pondicherry 01. Music starts at 8 pm with a second set at 9 pm. Call us for reservations or directions at 413 222 2963. The Purely Pondicherry Performance Series continues this Saturday with Holger Jetter on strings and Matt Littlewood on keyboard on Kasha Ki Aasha’s garden terrace. Classic tunes and contemporary compositions by these two international musicians based in Auroville are a treat for jazz lovers. Come enjoy. Dinner and Beverages are always available on jazz nights including our special pizzas and South Indian home style dishes! Reservations are available until 8:30 at 413 222 2963. Kasha Ki Aasha is just around the corner at 23 rue Surcouf in Pondy.